Bruyneel hooked. Still casting for Armstrong. A twitterific day for Twisted Spoke. What a rockin’ Monday morning. Twisted Spoke crawled out of bed Monday on a cold, wet rainy Belgian kinda day to discover we’d landed one of the two biggest fish in the cycling ocean. Jonan Bruyneel is now following TS on twitter. Holy moly. 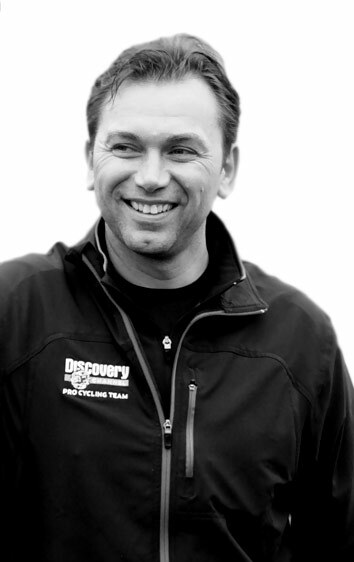 I held the iphone mail up to my wife to show her the fantastic news and she said “Who’s Johan Bruyneel?” Just kidding. Even my wife, who has a low interest in cycling personalities, knows who the famous director sportif is. Which is proof the flash cards I made her for christmas are yielding results. Bruyneel, along with Sir Armstrong and Phil Liggett form the holy trinity of cycling sainthood in my part of the world. Some people in Norcal stick a small buddha shrine in the corner for spiritual grounding –me, I got Bruyneel’s picture next to a sacramental bowl of Cytomax. If I were a political blogger, it would be like Al Gore following me. If Twisted Spoke was about Hollywood titillation, it would be like landing Brittany Spears. You want more analogies — of course you do. Let’s try this — Michael Jordan-Pele-Bono-Mandela-Clooney is following you on twitter. We tremble with excitment. So, a big, hearty, twisted welcome to arguably the greatest DS in cycling. Our first memory of Bruyneel was watching the ’95 tour when he basically drafted behind Indurain for what seemed like 50 miles, the Spaniard doing the entire workload, until Johan came round to steal the stage win. I remember thinking, wow, that guy has balls to just sit on King Indurain’s wheel like that. Sounds like a book title — “we might as well win,” right? That stage showed a part of the ruthless drive and modus operandi he would later employ as director sportif for US Postal, Discovery, Astana and now Radio Shack. Bruyneel will do whatever it takes to win a bike race. Eight Tour de France wins on his resume and he’s in the hunt for nine. Now your winning percentage tends to shoot up when you have Armstrong on the roster but who’d argue with Bruyneel’s many talents. The man can say “guys, ride at the front” in six languages. Someone once said that famous Alabama football coach Bear Bryant could beat you with his players, then switch and take yours and beat you again. Same deal with the battling Belgian. This year Bruyneel crossed over from famous team director into pure celebrity status. Bruyneel taught Armstrong how to win a grand tour and the Texan returned the favor by showing Johan how to become a glittering brand name. Bruyneel now works all media channels with his tweets, facebook fan page, website, youtube channel, sports marketing company and on and on. You wonder how Bruyneel manages all that? Same way The Man does — he has his people, the B-b-boys. And despite the 24/7 celebrity lifestyle, Bruyneel is still a master tactician. After discovering last year that Alberto Contador isn’t psychologically fragile, he and Armstrong have switched strategy. They realized you can’t beat the man but you can take a crowbar to his possessions — so they stripped Astana of every rider with a decent VO2 max. Okay, Bruyneel is the Twisted Spoke boat and we just cast the hook back in the water. Still have to land the biggest fish in cycling. This may take a while and it won’t be easy. Everybody knows the Texas Tarpon is a real fighter. « Cobra bites girlfriend. Riccardo Ricco, a true snake. Okay, first your 1-year blog-o-versary, now big J-B is on the Twisted Spoke nutz (not to be confused w/ DZnutz). Like woah! Mr. Walsh – enjoy the effervescent bliss of stardom & fame. Why somebody (VeloNews, CyclingNews, Bicycling Mag, even Versus?) hasn’t picked you up yet is beyond me!